Convert your traditional bicycle into a powerful electric bike in a minute with our smart electric front bicycle wheel! It's designed to replace your original wheel for longer mileage and faster speed. Powered by a 350W motor, it can achieve up to max 50km mileage at moped mode. And with the help of App, your cycling journey will be more wonderful than you ever expect. - Applicable: 24 / 26 / 27.5 / 29 inch and 700C wheel of mountain bike, road bike, leisure bike, etc. Want to be notified when the YUNZHILUN 24V - X iMortor 2.0 700C Electric Front Bicycle Wheel gets even cheaper? Make sure you snag the best price by entering your email below. We'll email you when the price drops, free! We're tracking the price of the YUNZHILUN 24V - X iMortor 2.0 700C Electric Front Bicycle Wheel every day so you know if that deal is really a steal! Check back for to check the best price for this product - and whether its current sale price is really the cheapest it's been! 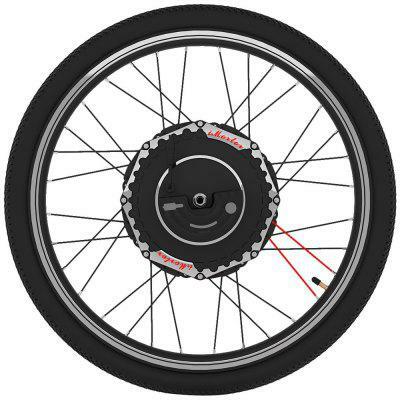 No YUNZHILUN 24V - X iMortor 2.0 700C Electric Front Bicycle Wheel coupons found!